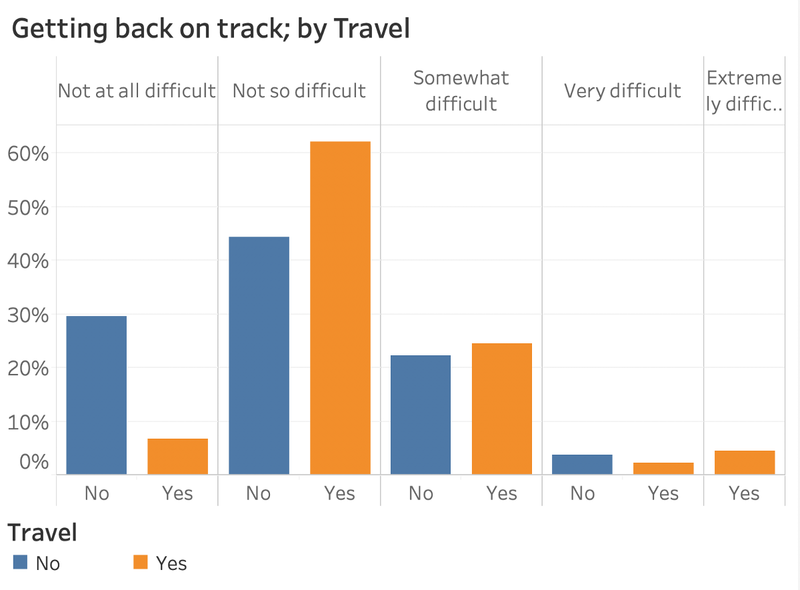 When traveling’s involved (as a guest or host), people have a tougher time. Most people aren’t too stressed about this, but some are, and keeping things in perspective helps. Do people feel less healthy? How hard do they work at it? 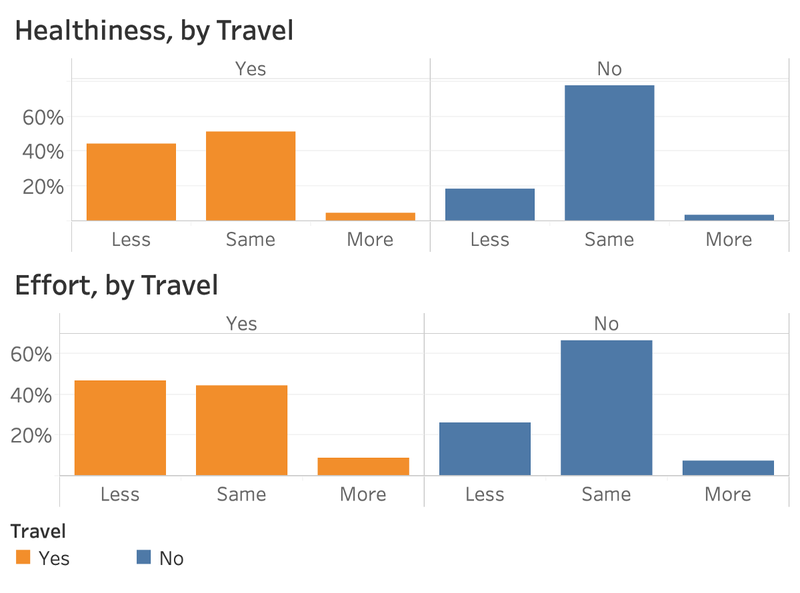 Does traveling make a difference? What’s the biggest cause of challenges? How hard is getting back on track? Does it stress people out? It can be hard to stay healthy during the holidays. You might be with family and friends, indulging with food and drinks, your routines fly out the window, and before long, your diet, exercise, and sleep may be suffering. You may find yourself thankful for the relationships in your life, but your body might not feel very thankful. 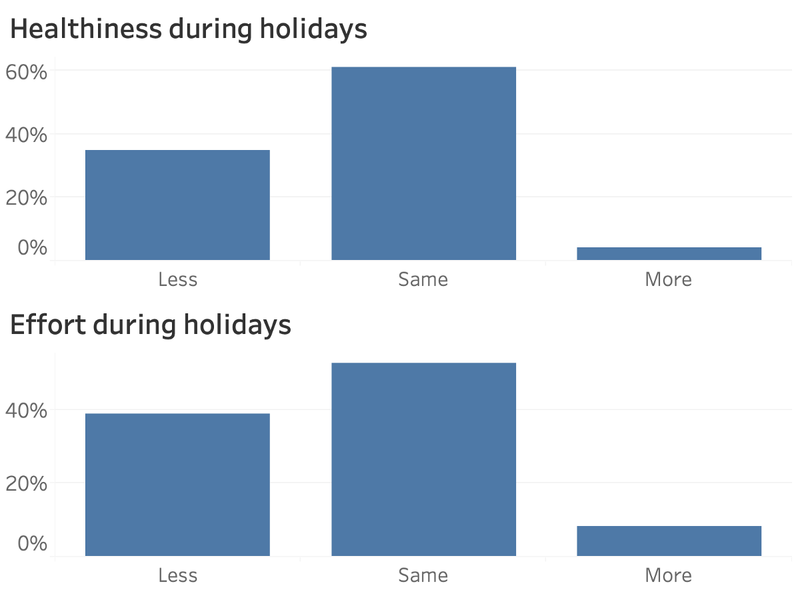 I wanted to know how people manage their health during the holidays. Unfortunately, our response rate wasn’t that good this week. We got about 350 the week before (homelessness survey), but we’re at 72 this week. Blame it on an unpopular topic, or low attention with people on vacation, or too many emails with Cyber Monday… Anyways, there’s still interesting stuff in here. 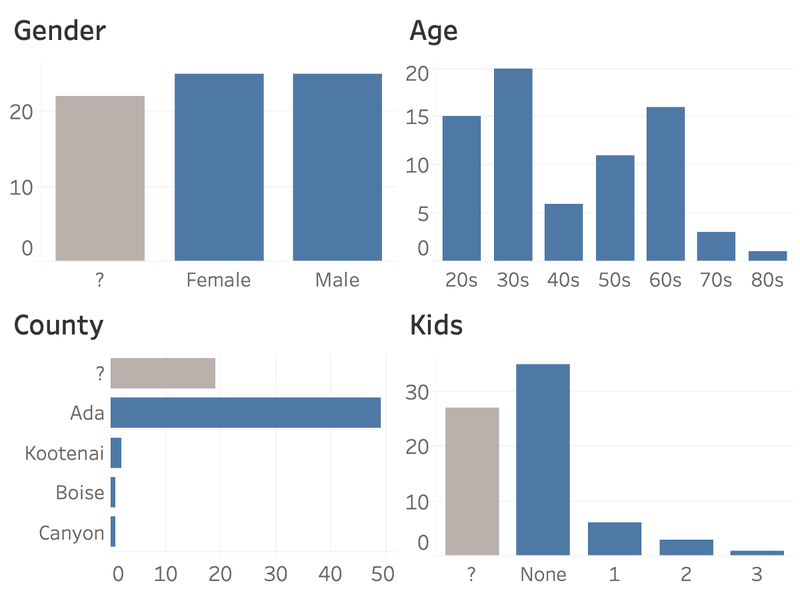 Of the respondents that we had previous answer history for, we were equally split on gender, were spread across the spectrum on age (with higher concentrations in 20s-30s and 60s), mostly from Ada County, and mostly respondents without children. My big question when designing this survey was whether everybody else felt as crappy at the end of Thanksgiving week as I did. With that in mind, the big thing I was looking for were differences in how healthy people normally feel compared to how they feel during the holidays. I also wanted to know how effort levels change during the holidays or not. Overall, the “Not so healthy” bar is bigger during the holidays than normal, and so is “A little effort” and “No effort at all.” However, there are still really big proportions of people that said they still felt “Very healthy” and spend “A great deal of effort” on their health during the holidays. 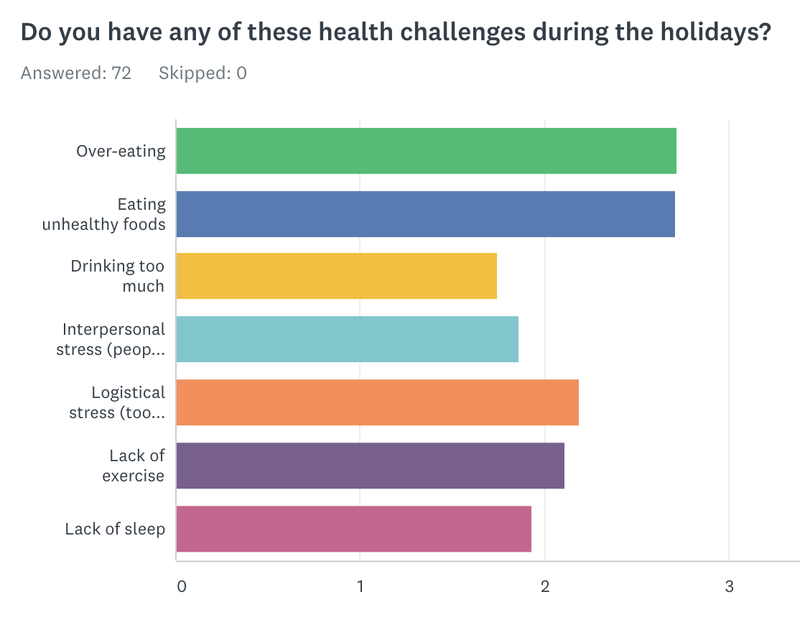 It’d be easy to assume that everyone’s health takes a downturn during the holidays, but we need to compare these on a respondent-level to determine that. Here we are. This chart shows how people’s feelings of health and their effort level change during the holidays. I was pretty darn surprised by this! The biggest group, by far, says that they feel just as healthy, and they put as much effort in as normally (actually, some people put more effort in!). My first reaction was that people have a lot more self control than I do, and I need to get my $h*t together next year. But before I go fully into self-shame mode, I decided to check a few more angles. So, usually holidays are a big ordeal for my family and friends. With my in-laws in Nevada, either we or them are traveling most years. When we get together, it’s been a while, and it’s time to party. (And I can end up partying too much…) I was curious to see if whether this situation is relevant to other people too. 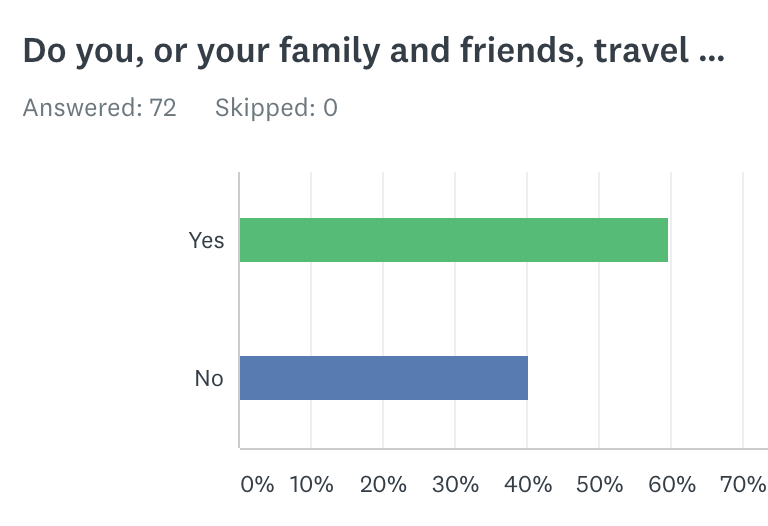 Overall, 60% of our respondents say that either their family or friends travel for the holidays. So, those folks are in a similar boat as me. The remainder would either have all their family and friends local (or the significant ones, anyways), or maybe they don’t congregate as much as some other people. With this nifty question, I can segment the above questions to see if people answer differently if traveling is involved. Okay, now let’s dig into some details. 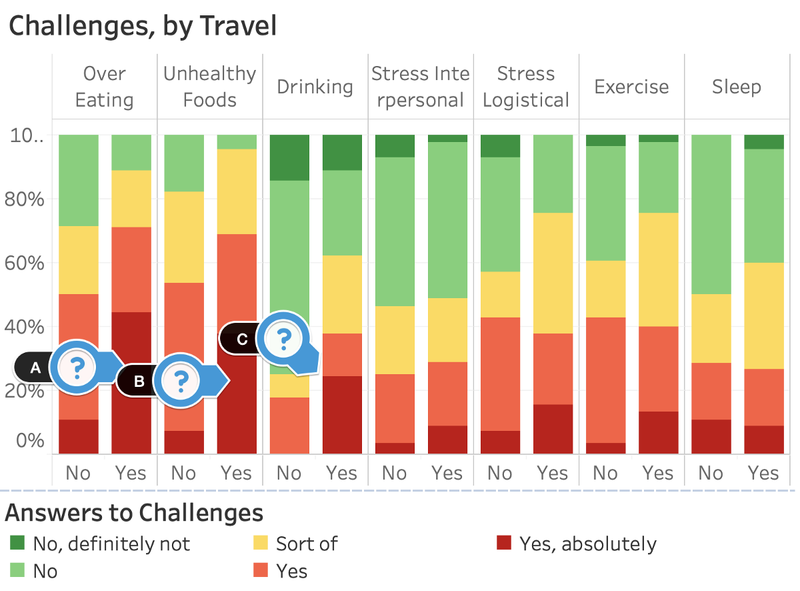 We know about travelers, how healthy people feel, and how much effort they put in, but what are their biggest health challenges? 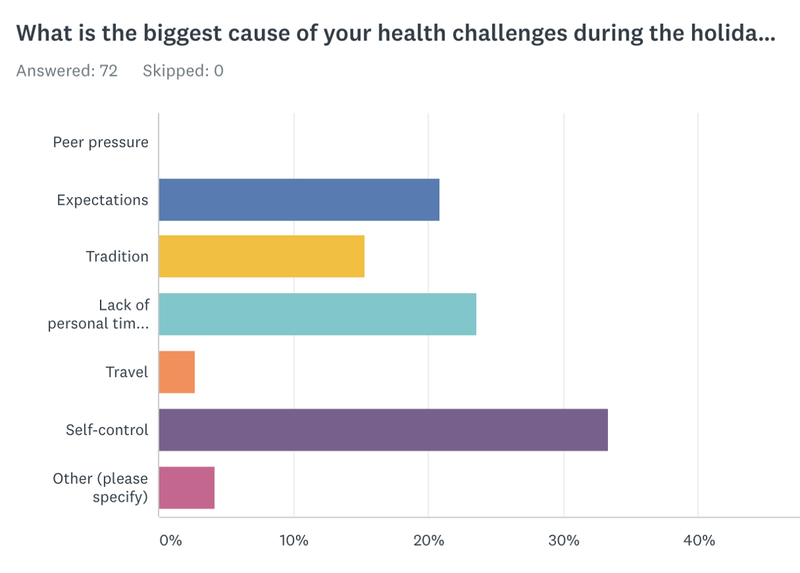 The weighted average chart in our overall results show that “Over-eating” and “Eating unhealthy foods” were the biggest challenges faced by our respondents. The smallest challenge was “Drinking too much,” though it looks like a fair amount of people chose that too (again, phew). None of this surprised me too much, but I would have expected the two stress options (interpersonal and logistical) to be more prominent. But let’s not stop there. I want to see how my traveler compadres are answering. This chart has a lot going on, so don’t panic. The different colors show the proportions of respondents that chose each challenge option. Green means they don’t experience a challenge at all and dark red means they “absolutely” do. There are two columns so that we can compare the people that traveled (“Yes”) to the people that didn’t (“No”). Now that we know which challenges different types of people are dealing with, let’s try to get to the root of the matter — why do they face these challenges? Our overall picture shows that self-control is the biggest thing to blame for the challenges people are facing. The second-biggest is “Lack of personal time and space.” And, we did have several “Other” answers which involved financial constraints and the added logistical challenge of moving (ouch). The least-selected cause was “Travel” — what?! You all can’t burst my bubble with justifying my challenges because of travel! Let’s double-check this. When cross-referencing the cause responses with whether people’s family or friends travel, there does appear to be different answers. The biggest standout to me seems to be the “Lack of personal time or space” option. Totally makes sense — when you’re visiting extended family, or they’re visiting you, you’re probably in guest or host mode most of the time, and you might not have time to decompress and reengage in your normal, maybe healthier, habits. I feel like we’re getting somewhere. Now, let’s put things in perspective — you might feel less healthy than you normally do during the holidays, but how hard do you think it’ll be to get back on track? Overall, the most common answer was “Not so difficult” (though the squished chart hid that one… woops). 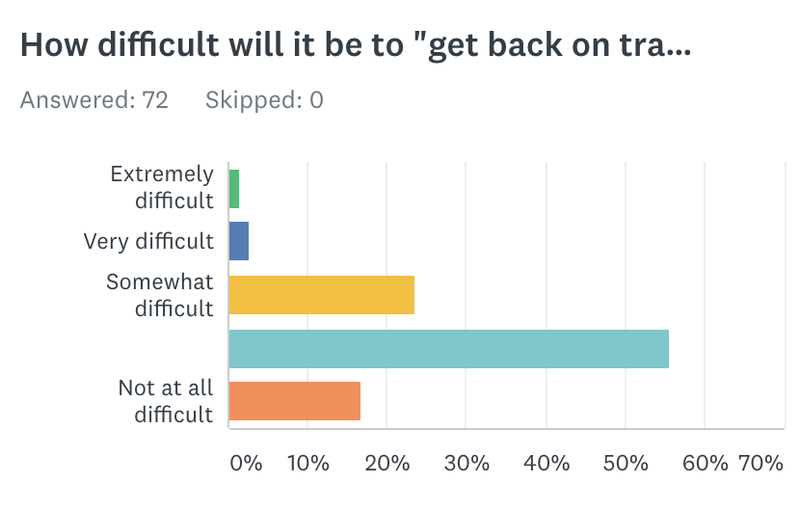 Besides those folks, most of the rest were split between “Somewhat difficult” and “Not at all difficult” (must be nice!). We had a few say it would be very or extremely difficult (I see you). But what can we learn from our traveler angle? Quite a bit more of our travelers didn’t think it’d be a piece of cake to get back on track (“Not at all difficult”), and instead the majority was in the “Not so difficult” camp. So, not a crazy separation of answers here, but looks kinda noteworthy to me. With all this in mind, let’s round out our perspective on this. Does your health during the holidays stress you out? Overall, it looks like most people say no. 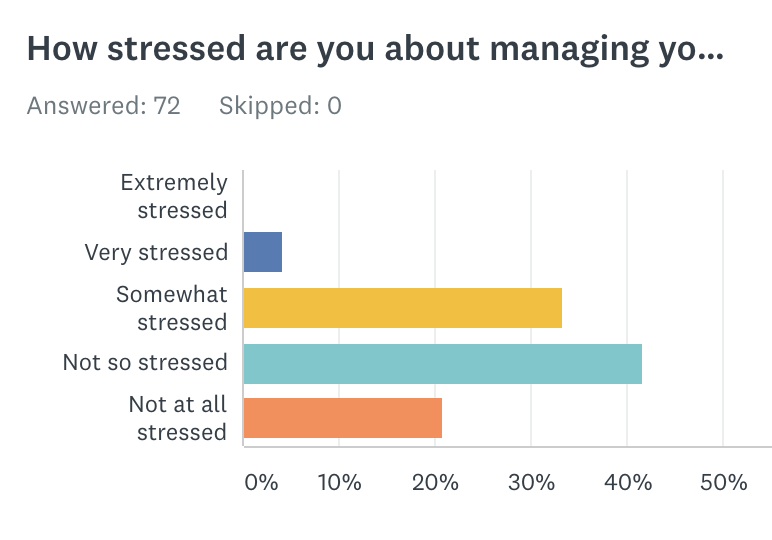 The biggest group was those answering “Not so stressed,” but if we combine the “Very stressed” and “Somewhat stressed” groups, they’re about as big. And then there’s all those “Not at all stressed” people that have things totally under control. 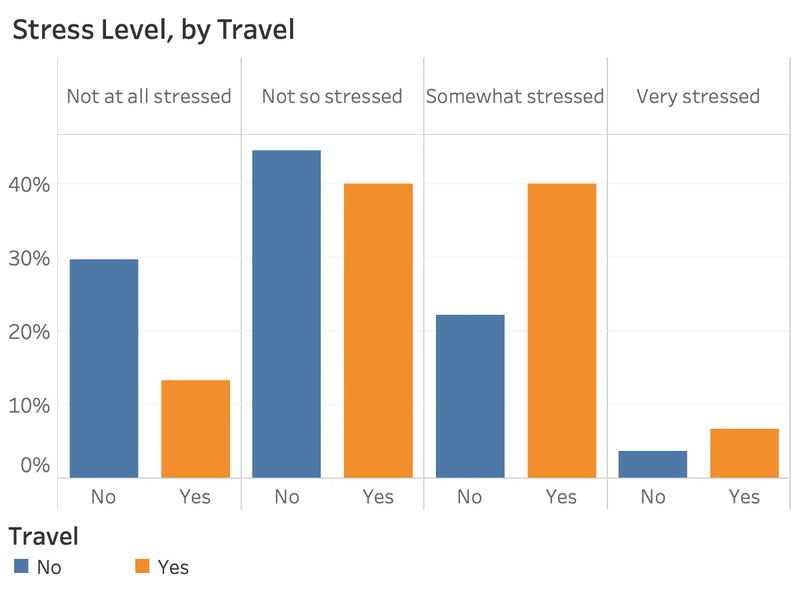 And my travelers appear to be a bit more stressed about their health than the non-travelers — looks like they answered “Somewhat stressed” twice as often. 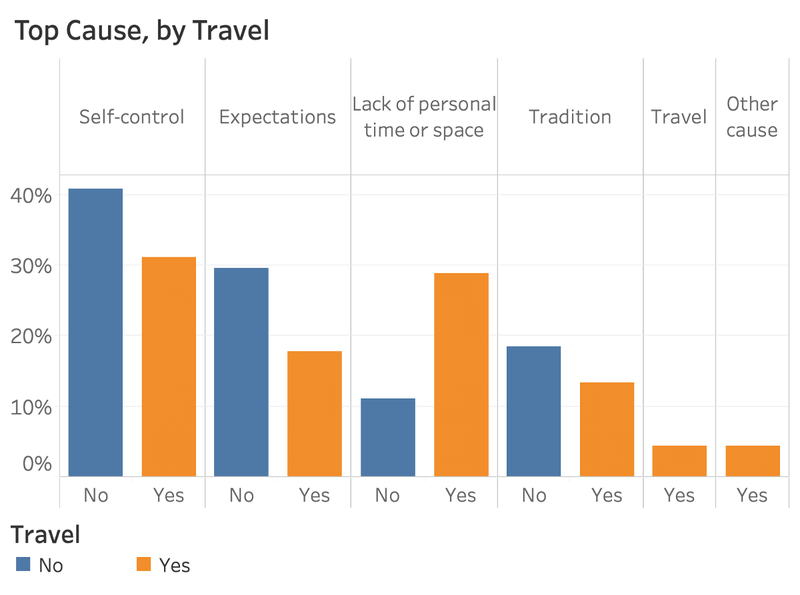 I hear ya — when you or others are traveling, you often have less control over your time, space, agenda, etc. 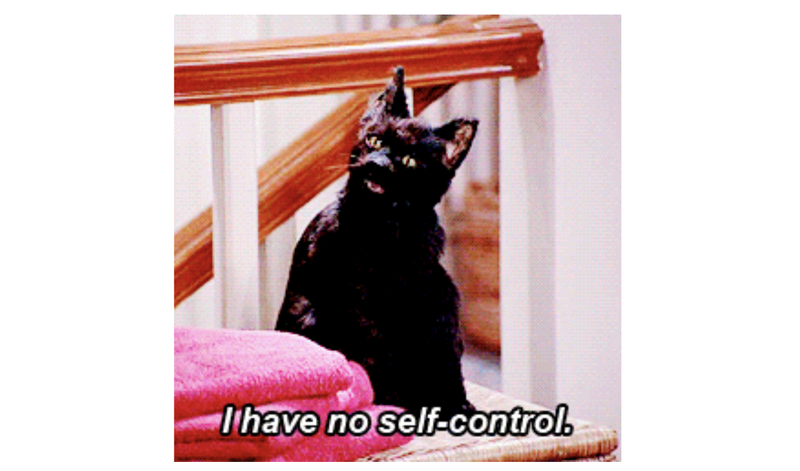 Nothing stresses me out more than not having control, so this makes perfect sense to me. Diet tricks resulting in a side dish no one eats but you. The goodies. I don’t think it’s honestly that bad of a thing to indulge in fun treats over the holidays. Yeah it’s not great for you, but live a little. The fact that it is a thing. I feel like over the holidays I have more time to work out and I surround myself with active people who like to be active in their free time. So, that’s what we do. I feel less healthy when I spend time around people who don’t value health, regardless of what time of year it is. Weight gain. It’s like two or three meals over more than a month. A couple meals shouldn’t really be that big a deal. New Year’s resolutions help me get excited to be better in the New Year, but also can be used as a crutch to throw better decisions out the window until January 1… then the resolution lasts for maybe one to two weeks… but, not this year!?! People stress too much about gaining weight during the holidays. Who cares? As long as you don’t eat “holiday-style” throughout the entire year, you’ll be fine. What you do for 2 or 3 weeks over the holidays isn’t as important as what you do for the other 11.5 months. Overeating / planning to diet as a New Years Resolution. Why not begin the healthy eating habits right now? Take less of a portion of mashed potatoes, or try new recipes to make those favorite holiday dishes just a little bit healthier. A diet/choosing healthier portions are things a person can make any time of the year — not just waiting until New Years to set a goal that almost all will fail. I do think we sometimes spend too much time focusing on what is unhealthy during the holidays. The question alone indicates that aside from the holidays, one is usually healthy. Which, if that is the case, taking a small bender isn’t going to send you to the grave any sooner if overall you are a relatively healthy person. I don’t think we need to be shaming people if they have an extra slice of cake, or exercise less for just one month. If anything, I think the expectations of mental and emotional health during the holidays are far more important to analyze, and why we stress ourselves out so much. It is a privilege to only look at one month of your year and complain it is unhealthy. Physical health, the holidays are not a time where you should be counting calories and measuring your food out on to a little scale. The holidays are about over indulgences and I think that’s totally fine for a few days. Aside from overindulgence, many of the cheapy decorations and dollar store stocking stuffers are made out of very toxic and dangerous materials that negatively affect your health as well. Producing them causes a lot of harm to those working in the factories as well as the environment, and continue to be unsafe at home for you and your family. Think before you buy! Little things that can be done like taking a ten min walk outside daily. Not thinking of food as bad but getting good food in daily but enjoying holiday food without guilt too. Keeping baseline habits is essential. It’s not all or nothing. Not playing the good food bad food game. Ways to exercise as a family. That might help with all the food and gives everyone a healthy way to spend time together. Who you spend your time with. If your family isn’t generally healthy, then your obligations will take you away from an active, healthy lifestyle. If your family is relatively healthy, then your obligations will be centered more around activities that are healthy (i.e. you’ll be cooking healthy food; going for walks, skis, hikes, etc.). Healthy outdoor activities can be a great compliment to those extra calories if it’s possible to stay motivated to be outside skiing, snow shoeing, yurt camping, snow boarding, etc. I think a lot of people (myself included) eat traditional holiday foods that decades ago would have been luxurious comfort foods, but today just add empty calories to an already calorie-rich 21st century diet. I think we should pay more attention to adapting traditions to suit modern-day lifestyles, like finding lighter versions of holiday food or incorporating active (movement-based) activities into our holiday traditions. The effect of sugar and alcohol (also sugar) on immune and inflammatory issues. Taking time to manage your mental health/stress. The holidays are a conduit for stress. Examples like dealing with difficult relatives, managing the amount of things you have to do, the logistics of hosting a family dinner. People view the holidays as a time to come together and commune, but so often that is overshadowed by a dumping ground of negative energy, venting personal problems, or projecting onto those people close to you that you came together to commune with in the first place. It’s important to remember your mental health and stress load as we approach and ride out of the holiday wave and make time to take care of it! Moderation. I’m a strongwoman athlete so I rely on moderation to guide me through the holidays. I don’t change my workout routine, but I indulge in pie, creamy foods, cocktails, and all the meat …. IN MODERATION. Then kicking back into full training mode isn’t so hard. Why don’t we focus more on the “true spirit” of the holidays, and less on consuming and making things perfect. I’m ok with missing a few extra workouts, or eating more than I usually do if it means this is the time of year we GENUINELY spend time with family and friends and our community. It is our mental and emotional health that is sacrificed more this time of year. As for physical health, there are 11 months out of the year that some people don’t have access to or know about healthy living. Why don’t we scrutinize those months and support physical well-being for those who poor health is actually impacting on a regular basis. Some holiday binging isn’t going to ruin you. But lack of access to real, healthy food, time for self-care, access to health care, and knowledge of healthy living is something that is very real for some people. Let’s shed some light on the systemic barriers that create that reality for people. Mental health, the holidays are stressful at the best of times and for a lot of us it’s a lot. Whether it’s people coming in that you may not get on with or hosting 30 people in your 2 bedroom apartment. The holidays are very stressful, so keep a look out for signs that you or someone you love is about to crack.